Super hero girl playing in field with wheat on a blue sky background. Slow motion. hd00:29Superhero girl running across field with wheat against blue sky and smill. Slow motion. 4k00:11BASHKORTOSTAN, RUSSIA - AUGUST 2017. AERIAL: Harvesters slowly cross the field, collecting wheat and raising clouds of dust. End of agriculture season, good weather, a huge field to the horizon. hd00:29Combine harvester in action on wheat field. Harvesting is the process of gathering a ripe crop from the fields. 4k00:15Woman with child in her arms communicates on computer. 4k00:34Beautiful and happy girl is dancing and singing while driving cars. Woman in car laughs. 4k00:15Dog gives paw to child. ?hild plays with dog in an autumn park in meadow. 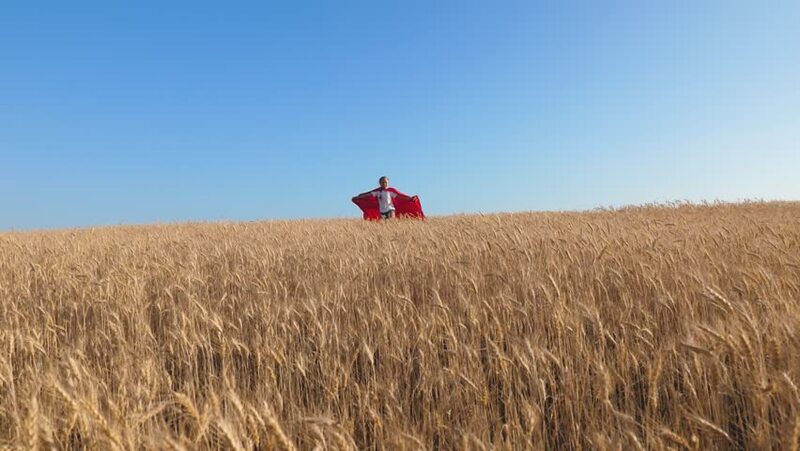 hd00:18girl plays Superhero, child runs in red cloak across field with wheat under blue sky. Slow motion. hd00:12Child rides along street on bicycle in glare of setting sun. Slow motion.